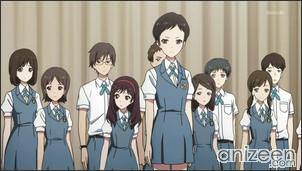 Wakana Sakai is a serious high school student; now she is known to be a loner. But before, she was skilled playing the piano and took music seriously. 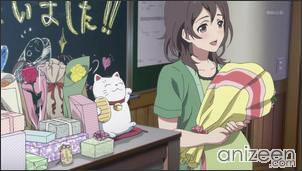 Unfortunately, her mother passed away and Wakana stopped loving music and somehow, regrets being close to this art. Now, as a senior, she has no desires to do anything related with music or even friendship. But Konatsu Miyamoto has a different idea and once she decides to leave the choir club, Konatsu decides to create a new one, where she could finally perform in front of an audience. This, because last year, she failed to sing in front of an audience and her club teacher simply set her apart as a punishment. Meanwhile, the whole class is preparing to say goodbye to their home room teacher, Tomoko Takahashi, who is expecting a baby and will take some time to take care of her. That same day, a boy named Atsuhiro “Wien” Maeda transfers into the class. Wien has been living abroad in Austria for twelve years, so he has learnt some Japanese customs through old books. Now that he is at school he finds out that Japan is a lot different and wishes to feel comfortable in the near future. 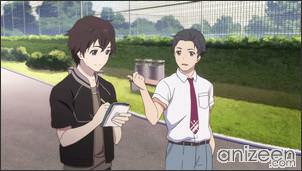 Then, Taichi Tanaka, the sole member of the badminton club is told to show the school grounds to Wien. 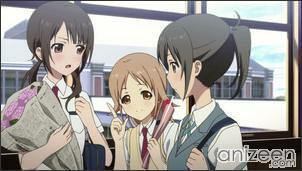 Konatsu has left the choir club and wants to fulfill her ambition, and with that in mind asks Wakana to join her. 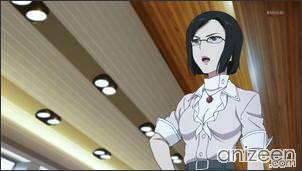 With all her regrets, Wakana gets mad and tells Konatsu not to bother her. In return, she tells Wakana that she’ll do it, and that she won’t stop before even trying. To end her fear to crowds, Konatsu has been practicing for some time now. She goes on a daily basis to a near park and sings joyfully. 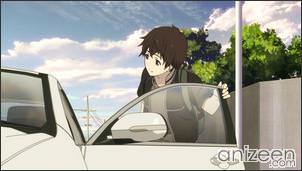 One of her school friends, Sawa Okita, agrees to help her friend and tags along on a certain Sunday. To her surprise, while Konatsu is singing Wakana, Taichi and Wien are there to see her performance. Now, Konatsu has gathered enough members for her new club and won’t stop until she can make her dream come true. They will all understand that as senior students, there will always be time to both look forward. And that a lot of good and bad memories will make them smile and cry. But somehow, in the course of those days they will be able to understand where their life is going. Wakana Sakai lives with her father and her pet cat, Dora. Her mother passed away some time ago. Despite the fact that she is apparently very good at singing, she refuses to do so to the point of turning down Konatsu’s attempt to recruit her into her new choir club. When she was in her last year of middle school, she was too focused on her exams, she now lives with regret for being unable to say “I’m going”, “sorry”, and “thank you” to her mother. She is in the same after-school class as Wien. 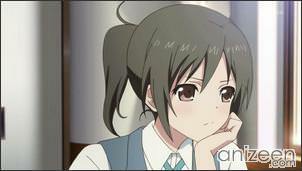 Konatsu Miyamoto is a short, earnest girl who loves to sing and dance. She was previously affiliated with the choir club until she had a falling out with their supervisor, who prevented her from singing due to an incident a year prior when she was attacked by stage fright during their recital. After this incident, Konatsu began training herself by performing in the public park. She decides to create her own club so she can sing in front of the school. When this club falls short on members, she combines it with Taichi’s badminton club to form the ‘Choir and sometimes Badminton Club’. Sawa Okita is Konatsu’s best friend. 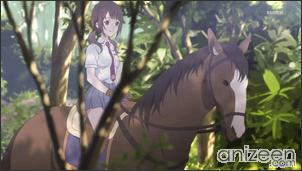 Apart from being an equestrian with her horse, Sabure, Sawa is also a member of the archery club, and is the first member invited by Konatsu into the latter’s new music club. She wishes to become a professional jockey in the future, which often leads her to dispute with her father, who believes it to be simply playing around. Taichi Tanaka is the sole member of the badminton club, Taichi is a very serious person yet insensitive person if it’s concerned about girls. He’s hoping to become a pro badminton player someday. He is also the student assigned to guide Wien around school on his first day. Taichi is also good at singing. 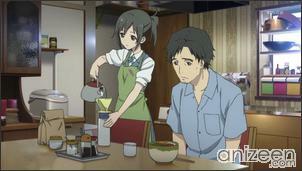 Tari Tari is a Japanese television anime series produced by P.A. Works and directed by Masakazu Hashimoto. 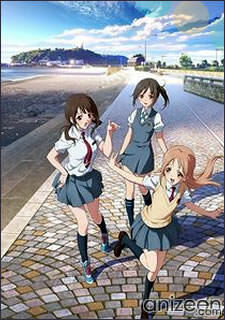 The series began airing in Japan from July 1, 2012 and is also being simulcast by Crunchyroll. 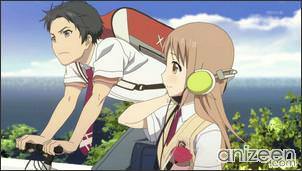 The series is licensed in North America by Sentai Filmworks. A manga adaptation illustrated by Tomiyaki Kagisora began serialization in Square Enix’s Gangan Joker magazine from May 2012.